The Compromise of 1850, like any compromise, was a compromise intended to satisfy the parties involved by making slavery concessions acceptable to all concerned. The major difficulty in maintaining any compromise is the test of time, because due to unforeseen circumstances and situations that arise the agreement usually needs to be amended or perhaps discarded. 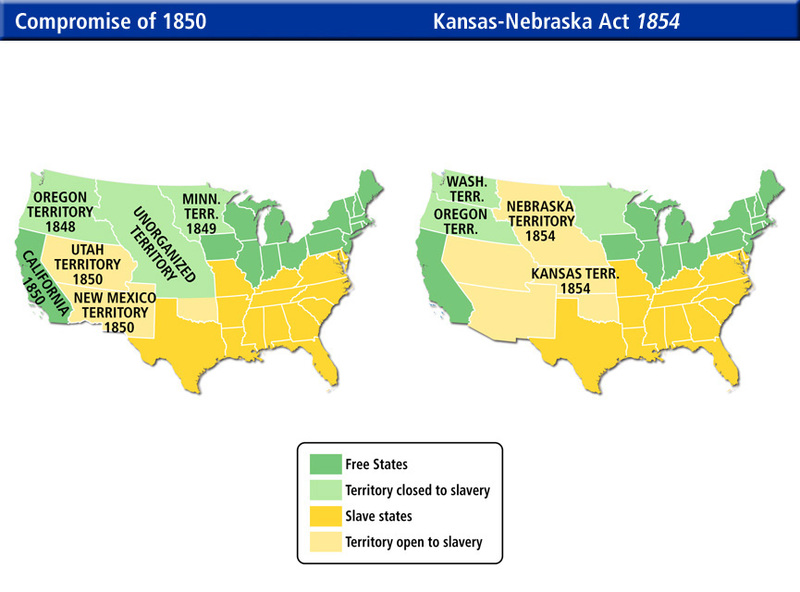 Regarding a long list of compromises and the subject of slavery and its expansion into new territories and states acquired by the United States, the Compromise of 1850 followed the Missouri Compromise of 1820, which was ruled unconstitutional and later repealed by the Kansas Nebraska Act of 1854. Why so many compromises? Simple answer. Although the 13 Colonies had declared their independence in 1776 and formed the United States of America, the new nation grew rapidly by expanding its boundaries through a series of land acquisitions. With each transaction, the question arose as to whether or not the new soil would become a slave or free state. In merely four years, 1845-1848, the United States had concluded its largest procurement of territory in its history, pushing its western boundary to the Pacific Ocean. 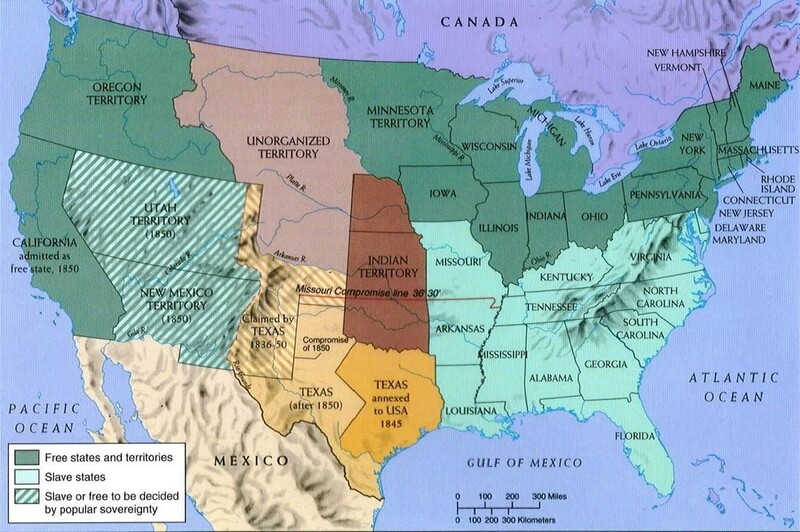 With the annexation and statehood of Texas in 1845 and the nation's acquisition of 55% of the territory of Mexico during the Mexican Cession of 1848, the U.S. had increased its borders by more than 60% and now extended from coast to coast and sea to shining sea. The Compromise of 1850 was born out of the largest land purchase in the nation's history in 1848, and after 1850 the balance between slave and free states no longer existed. Until 1850 the nation had hosted 15 free and 15 slave states, creating an equitable balance in political power. But with the Mexican Cession in 1848, officially the Treaty of Guadalupe Hidalgo, the nation purchased territory that forms the present-day US states of California, Nevada, Utah, most of Arizona, about half of New Mexico, about a quarter of Colorado, and a small section of Wyoming. Although California was admitted to the Union as a free state in 1850, the United States soon added three additional free states with Minnesota in 1858, Oregon in 1859, and Kansas in 1861. The nation was now confronted with an imbalance of political and economical power between slave and free states, known as sectionalism, which served only to fuel existing tensions between the North and South. The Mexican Cession resulted in the Compromise of 1850 and the rapid shift in political power and influence, and it fanned the flames of sectionalism and secession. Eleven years later, in 1861, the very heart and soul of the Union itself would be challenged during the nation's Civil War. What was the Compromise of 1850? The 1850 Compromise was the genesis of five bills passed mainly to address issues related to slavery. The bills provided for slavery to be decided by popular sovereignty in the admission of new states, prohibited the slave trade in the District of Columbia, settled a Texas border dispute, and established a stricter fugitive slave act requiring citizens to assist in the recovery of runaway slaves. See also Transcript of the Compromise of 1850. What Caused the Compromise of 1850? The Compromise of 1850 was caused by the purchase of 55% of Mexico's territory by the United States according to terms agreed upon in the Mexican Cession of 1848. Lands gained by the Mexican Cession, a result of the U.S. victory in the Mexican-American War (1845-1848), with the recent statehood of Texas in 1845, added more than 60% to the size of the United States in just four years. With the defeat of Mexico and the newly purchased territory by the nation at the discounted price of $15,000,000, numerous states would be created, forcing the institution of slavery to the forefront of both houses, resulting in some of the most contentious debates in the nation's history. Compromise of 1850 and Fugitive Slave Law. New lands meant whether slavery would be permitted. What was the Result of the Compromise of 1850? The major result of the Compromise of 1850 was that it failed to create and preserve the political balance between free and slave states in the Union. The Compromise caused an imbalance with 15 slave and 19 free states, resulting in political and economical power which favored the North, causing sectionalism. Immediately following the vast territory purchased from Mexico in the Mexican Cession of 1848, Washington debated whether the territory should be carved into slave or free states. 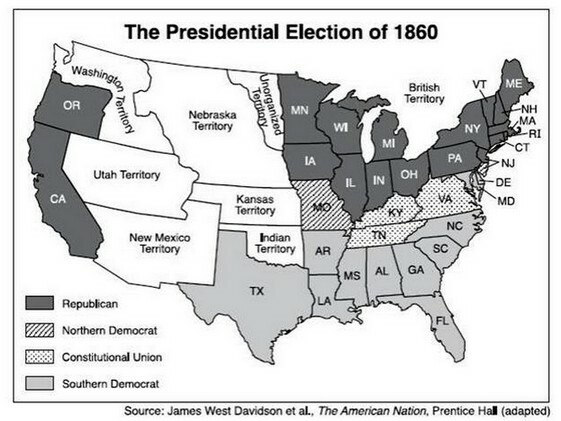 Prior to the Cession there were 15 free and 15 slave states, but subsequent to the Compromise of 1850, California was admitted to the Union as a free state in 1850, followed by three additional free states with Minnesota in 1858, Oregon in 1859, and Kansas in 1861. No slave states were added to the United States during that time, so the nation was now confronted with an inequitable balance of political power known as sectionalism, which served only to fuel existing tensions between the Northern and Southern states. The Mexican Cession resulted in the Compromise of 1850, the rapid shift in political power and influence, and finally the American Civil War. Because the Compromise produced sectionalism, in just eleven years, 1861, the nation would be engaged in bloody Civil War in an effort to contest and settle on the battlefield what it had failed to achieve in both houses of Congress for nearly one century. (About) The Missouri Compromise of 1820 was ruled unconstitutional by the Supreme Court and superseded by the Kansas-Nebraska Act of 1854, which also succeeded the Compromise of 1850. Because each compromise strived to maintain a political balance between free and slave states, but did not address whether the nation itself should be antislavery or proslavery, the opposing sides would soon decide their sectional differences on the battlefield during the American Civil War, which began in 1861. The Compromise of 1850 consisted of five laws passed in September of 1850 that dealt with the issue of slavery. In 1849, California requested permission to enter the Union as a free state, potentially upsetting the balance between the free and slave states in the U.S. Senate. Senator Henry Clay introduced a series of resolutions on January 29, 1850, in an attempt to seek a compromise and avert a crisis between North and South. As part of the Compromise of 1850, the Fugitive Slave Act, commonly referred to as the Fugitive Slave Law of 1850, was amended and the slave trade in Washington, D.C., was abolished. Furthermore, California entered the Union as a free state and a territorial government was created in Utah. Also, an act was passed settling a boundary dispute between Texas and New Mexico that also established a territorial government in New Mexico. 1) California entered the Union as a free state. 2) New Mexico and Utah were each allowed to use popular sovereignty to decide the issue of slavery. In other words, the people would decide whether the states would be free or slave. 3) The Republic of Texas relinquished claimed land in present-day New Mexico and received $10 million to pay its debt to Mexico. 4) The slave trade was abolished in the District of Columbia. 5) The Fugitive Slave Act made any federal official who did not arrest a runaway slave liable to pay a fine. See also Compromise of 1850 and the Fugitive Slave Law. The Compromise of 1850 dealt with the expansion of slavery into recently acquired territory by the United States. The Compromise of 1850 was a direct result of the lands obtained by the United States in the Mexican Cession, officially Treaty of Guadalupe Hidalgo in 1848. Because of its humiliating defeat during the Mexican War (1846-1848), Mexico gave the US a majority stake, a mammoth 55% of its territory. With the vast territory acquired rapidly by the US, the expansion of slavery was hurled onto the floors at both houses of Washington in some very heated debates, including the Compromise of 1850. Once the Treaty was signed, the United States owned more than one-half of Mexico and it now spanned from the Atlantic to Pacific oceans. From the signing of the Declaration of Independence on July 4, 1776, the fledgling 13 Colonies had expanded westward and from sea to shining sea in merely 72 years, and by doing so it had henceforth removed the presence of the world powers of England, Spain, and France. Slave and Free States Map. 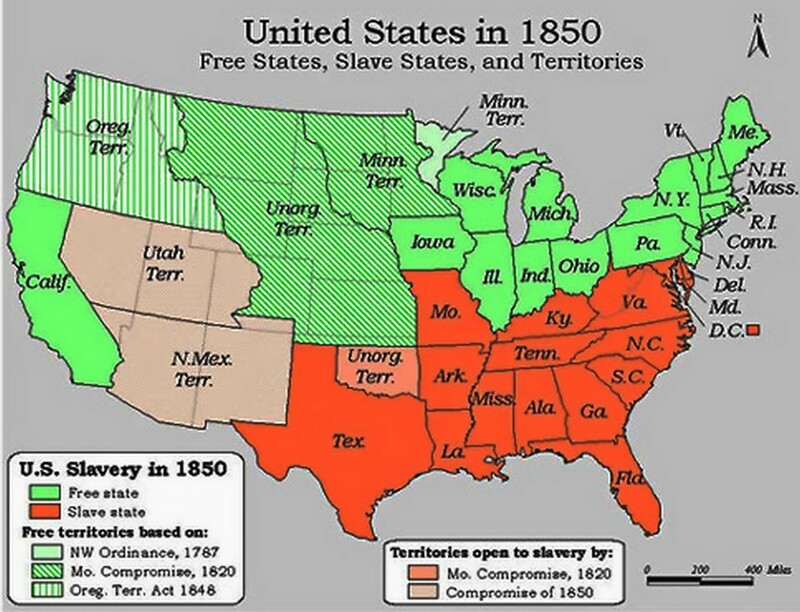 Compromise of 1850 and Slavery Map. The United States and its major territorial acquisition made slavery and its expansion the center of numerous contentious debates in both houses. General Zachary Taylor had won fame in the Mexican War and would ride his battlefield successes into the White House. As the 12th US President, Taylor had succeeded his commander-in-chief, President James K. Polk, who had pressed the nation into the Mexican War. President Polk, who had promised the nation that he would be a one term President, died of cholera just three months after leaving office. Taylor, a Southerner but Unionist at heart, was now confronted with the results of his acclaimed generalship during the recent conflict, but while in office he strived to appease both the North and South on the issue of slavery through a series of compromises, such as the Compromise of 1850. After Taylor died from illness just 500 days into office, future US Presidents would continue to pass the mantle of compromises until President Abraham Lincoln assumed office in 1861 and issued a clarion sound on the subject of slavery, leaving no doubt as to his position on the peculiar institution. A major result of the Mexican-American War (1846-1848) was an acceleration of the American Civil War, a conflict between the Northern and Southern states, which commenced in 1861, merely 13 years after the Mexican Cession and at a cost of 620,000 American lives. Recommended Reading: Henry Clay: Statesman for the Union. From Library Journal: Award-winning historian Remini has written the definitive biography on controversial 19th-century politician Henry Clay of Kentucky. Remini's work, which uses a rich array of primary sources, especially letters uncovered by the Henry Clay Papers publication project, surpasses earlier studies of Clay by Glyndon Van Deusen (The Life of Henry Clay, Greenwood, 1979) and Clement Eaton (Henry Clay & the Art of American Politics, 1962). All facets of Clay's life are examined, especially much new information about his private life and how it influenced his public political career. Remini analyzes why an accomplished political leader such as Clay could never be elected president, though he ran for the office five times. Continued below…. Clay's political success came from his extraordinary talents as the engineer who directed three major compromises between 1820 and 1850 through Congress, thus averting civil strife and keeping the Union together. This is an excellently written, superbly crafted, and long-needed biography that is suitable for academic and large public libraries. About the Author: Edmund S. Morgan is Sterling Professor of History Emeritus at Yale University and the author of Benjamin Franklin. Morgan was awarded the National Humanities Medal in 2000. Recommended Reading: Arguing about Slavery: John Quincy Adams and the Great Battle in the United States Congress. Description: In the 1830s, slavery was so deeply entrenched that it could not even be discussed in Congress, which had enacted a "gag rule" to ensure that anti-slavery petitions would be summarily rejected. This stirring book chronicles the parliamentary battle to bring "the peculiar institution" into the national debate, a battle that some historians have called "the Pearl Harbor of the slavery controversy." The campaign to make slavery officially and respectably debatable was waged by John Quincy Adams who spent nine years defying gags, accusations of treason, and assassination threats. In the end he made his case through a combination of cunning and sheer endurance. Telling this story with a brilliant command of detail, Arguing About Slavery endows history with majestic sweep, heroism, and moral weight. Sources: U.S. Department of State; Stanley W. Campbell, The Slave Catchers: Enforcement of the Fugitive Slave Law, 1850-1860, 1970; Don E. Fehrenbacher, The Slaveholding Republic : An Account of the United States Government's Relations to Slavery, 2002; John Hope Franklin and Loren Schweninger, Runaway Slaves: Rebels on the Plantation, 1999 Yale Law School: The Avalon Project; Library of Congress, National Archives, National Park Service, Ourdocuments.gov, US Department of State, WhiteHouse.gov, US Census Bureau, nationaatlas.gov.